This is our family favourite dish, crispy pork chop. I learn this dish from a Taiwanese cooking show. It is really easy to prepare. Some of you might concern about problem of keeping used oil after deep frying. I have the same thinking as you too. Crispy = deep fry with lots of oil. After watching the show I learn that actually crispness can be achieved with pan fry (amount of oil about half way cover the food). I pan fry in 2 batches. So this can minimize the consumption of oil. Hope you will try. 1. Tenderized the pork slices and set aside. 2. Dissolve the salt and pepper in the water. Add in the tenderized pork and marinate about 30 minutes. 3. Place the flour, beaten egg and breadcrumb separately. 4. Place the pork slice on kitchen towel to dry. 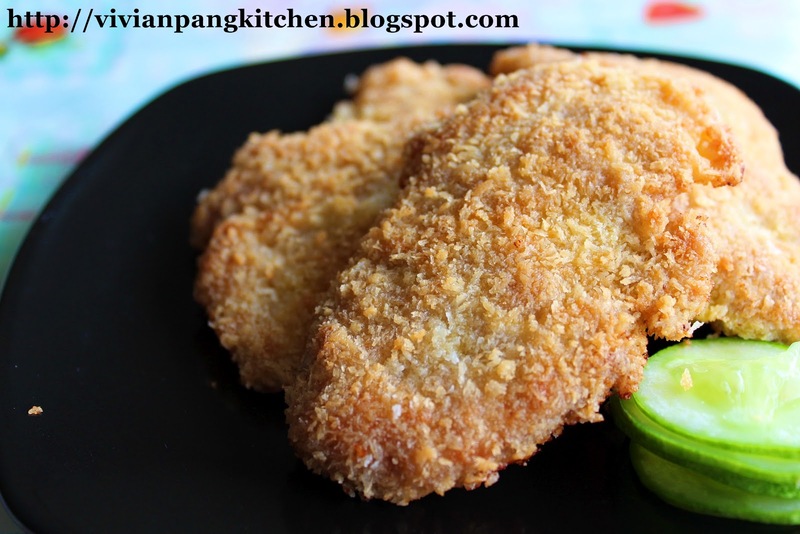 Coat the pork with flour, egg and lastly breadcrumb. Proceed with the rest till finish. Leave aside for about 10-15 minutes. Now is ready for pan fry. 5. Heat up a wok. Pour in vegetable oil (about half way cover the pork slices). Arrange the coated pork slice inside. 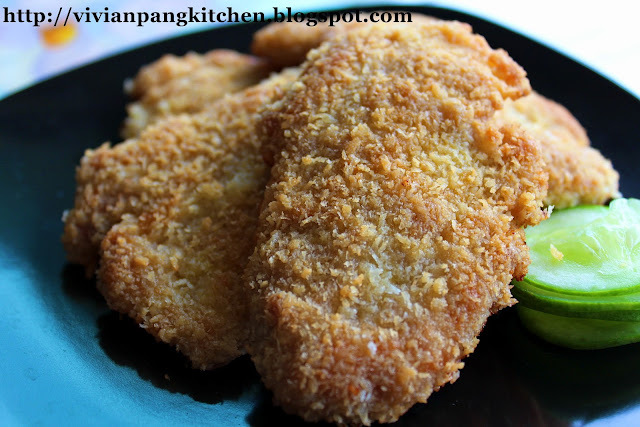 Fry with medium low heat till cooked and golden brown. 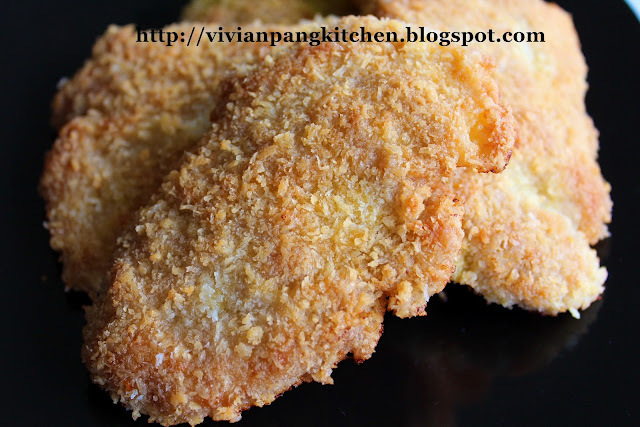 *do not fry with high heat as the breadcrumb will get burn easily. 6. Place on kitchen towel to drain excess oil. Serve! 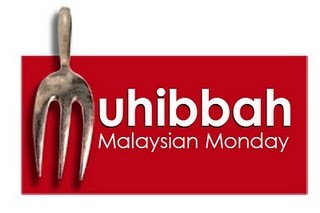 I'm sharing this post via Muhibbah Malaysian Monday. Pork chop rice used to be my fav ! Yours look truly tempting. Btw, wishing a Happy Belated Mother's Day, Vivian. Have a great week ahead. I like deep fried stuff. I will try this out. Thanks for sharing. Ps I am following you and hope that, if you like my blog, you will follow Carole's Chatter too. Super that you linked this in. Have a greet week. Found your recipe via Carole's Chatter. Sounds delicious!